Horsham Decks and Patios are garden landscaping specialists, including builders of wooden and composite decking and all types of patio and terrace, from natural stone to concrete pavers. 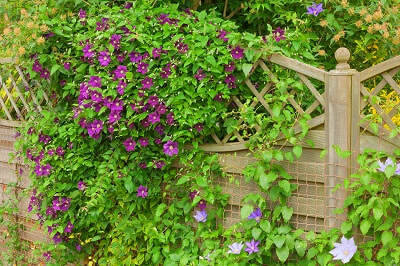 We also build beautiful pergolas, raised flower and vegetable beds and retaining walls. In fact we can tackle all landscape gardening jobs, from small paths to sweeping terraces and from raised beds to block-paved drives. When you want the best for your garden, you can call on our landscapists for free advice and a quote. Call us now on 01403 540162 or fill in the form for a quick response. Constructing a garden can be a daunting undertaking and the best approach is to make a fairly detailed plan before you begin. Whether you outsource landscaping work or undertake it yourself, it pays to get everything on paper (or computer) before work commences. Be as detailed as you can and consider the project from every angle, consulting whoever is likely to be using the space - including the kids! Once you have all the information and your plan is complete, you can work out what materials are required and the costs involved - or consult landscape gardening experts like ourselves to help. Depending on the scale and ambition of your design, you may want to call on a professional landscaper to take on all or part of your project. 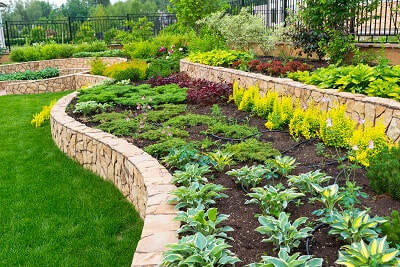 We can accommodate your requirements and give you quote for your landscaping. We can do it all or take on responsibility for the work you don't want to tackle yourself. What could be more wonderful than relaxing on your beautiful deck on a warm summer’s evening? You have a project in mind, but there’s a lot to be considered before you have your decking built. 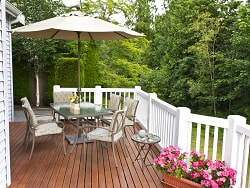 Over the years we've built all types of decking from economical pine or larch to luxury cedar wood. It's important to ensure that your deck is properly laid and treated to ensure a beautiful finish and that it's practical and long-lasting. Both wooden and composite decking can give you an inviting outdoor space that’s easy on the eye and may be designed with a traditional or modern look. Properly constructed, it will be an asset that adds value to your property and makes an appealing feature if you decide to sell. Deck installation is one of our most popular services. The warm feel and look of natural wood appeals to many of us, but which type of timber will you choose? Will it be treated? How long would you like it to last? What sort of wear and tear will it get? Luxurious timber decking can provide a private space to lounge on sumptuous outdoor sofas or a practical space for the children to play out of the mud on a winter’s day. We can provide and build hardwood decking or softwood decks to suit your requirements, whether you’re looking for an inexpensive pine deck, long-lasting cedar decking or a beautiful hardwood deck. Our experts will help you plan an outdoor dining area, a hard-wearing surface for the kids or simply somewhere for you to chill. It’s important to choose timber that will meet your expectations and your budget, bearing in mind maintenance and longevity. Wood may be stained to enhance its appearance or to match the surroundings. Our Horsham Decking and Patio installers are always happy to advise on the best type of wood decking for your needs. Composite decking is becoming increasing popular since the quality and choice has improved immeasurably over the last few years. 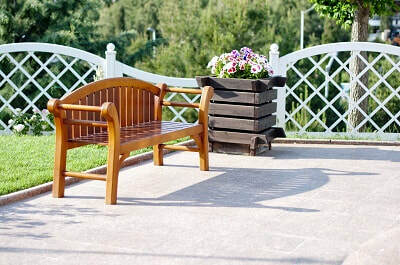 Made of recycled plastics and wood fibres, composite is more expensive than the cheaper wooden decks, but offers savings in maintenance costs over the life of the product. You can choose different colours to suit your garden and property, so a composite deck is a flexible option. Where do we begin with patios? There's an endless choice of size, shape and materials. Traditionally we had a patio or terrace built around the house but increasingly we're building a leisure area elsewhere in the garden. 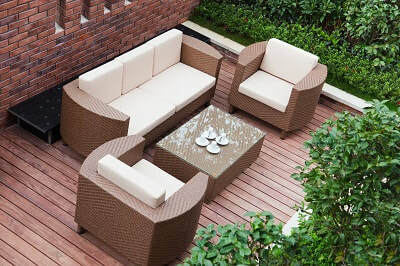 It makes a great entertainment space, often housing a barbecue, gazebo or summer house. We're all making more use of our gardens these days and the possibilities are exciting. Our patio builders will help you choose the best type of paving, whether that's Horsham Stone, York Stone or other natural stone or concrete pavers. You'll want something that harmonises with your property and complements the garden, perhaps a block paving patio or something completely different. You may need a retaining wall if the garden is uneven, or perhaps you'd like balustrading to add some drama or maybe you like the feel of a piazza or a verandah. 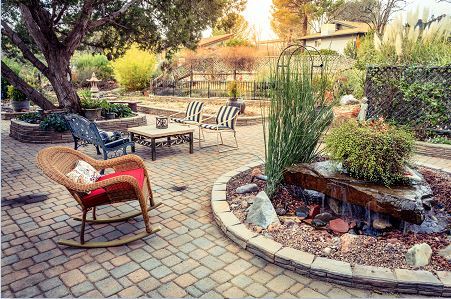 All your visions can be accommodated so speak to our landscape gardeners about your aspirations and the type of patio laying that will suit your home. There are many types of paving suitable for use in the garden, from natural stone to concrete slabs. The choice is amazing, limited only by your imagination! Coloured paving can add a whole new dimension to your outdoor space, bringing atmosphere to a cosy corner or giving a fun tone to a play area. York stone and Horsham stone paving are always popular, giving a timeless classic look, or you can choose anything from granite, limestone, slate, Indian sandstone or ceramic paving. They range in hue from pale sandstone and beautiful pale blue-greys to blacks. For a patio you may wish to choose a pattern with rectangular pavers, in straight lines or offset, incorporate circles or other shapes. It pays to spend a while designing a patio that will enhance your home and your garden, because our patios are built to last and will be an investment that adds value to your property. 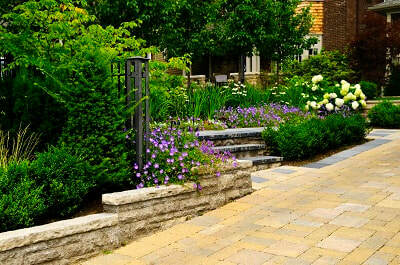 Consider whether you want to match your patio with paved paths and other areas in the garden. This may influence the pattern you choose to give a harmonised appearance throughout. There's no doubt that quality paving can add character and practicality to your valuable outdoor space. Block paving deserves a section all of its own. There are so many ways you can lay the blocks to give entirely different looks, incorporating patterns or keeping it plain. There are concrete setts and cobbles, smooth blocks or brick blocks, or clay block paving, in a huge variety of shades so you can produce a truly unique look. Traditional Drivesett Tegula blocks are always a popular choice. Block paving first became popular in the UK around 30 years ago, at which time there was little choice in design. The options were clay or concrete blocks with a couple of colour variations. But times have changed and now there is a huge choice of pavers, which are available in different shapes and colours giving an infinite variety of designs for your project, whether it be a driveway, patio or other paved area. Whether you want block paving at home or for your office or commercial space, we can provide and lay to a high standard, producing a driveway or patio you'll be proud of. Take a look at some of our block paved work in the gallery. 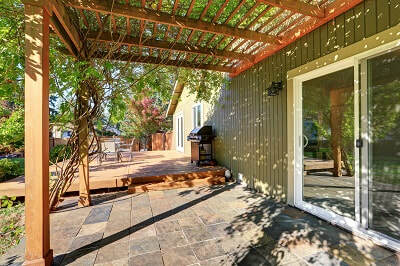 A pergola can be a standalone structure or attached to your property. It may have a roof or be open to the elements. And you may or may not grow climbing plants up the supports. Like most features in the garden, pergolas are adaptable and take on the character you choose. 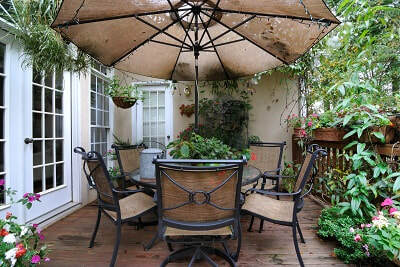 You may want to build a brick pergola or a wooden pergola, perhaps to cover a barbecue area or an outdoor bar. Or maybe you want a simple construction that will keep the elements away from your back door. We build beautiful pergolas to fit any situation and to harmonise with your landscape. Raised flower beds and vegetable planters are so practical and becoming popular in any size garden. As well as the obvious benefits of saving knees and being more accessible, raised gardens have the advantage of containing plants and restricting the growth of weeds! While traditional patio pots are great, they do provide a small growing area which is quickly depleted of nutrients so that the soil or compost generally needs to be replaced frequently. Larger enclosed beds and planters have the advantage of providing more space, whilst still limiting growth and spread of voracious species! It's also a lot easier to control garden pests like snails and slugs - always good news for the keen gardener. 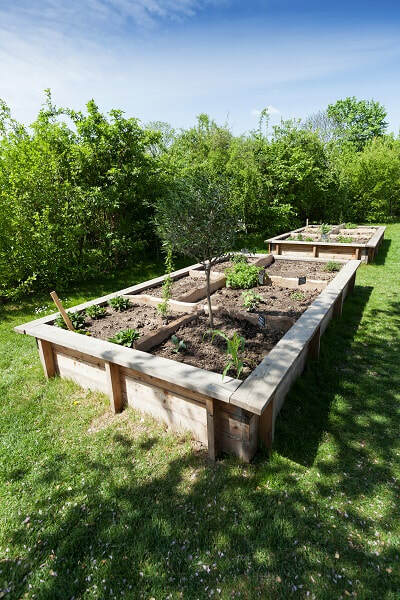 For elderly or disabled gardeners, raised beds can be a boon. They allow you to access plants without stooping or from a wheelchair. We can construct wide paths and even put in handrails to allow you to move more easily around your garden in safety. Almost anything can be grown in a raised planter – only limited by your imagination! With the move towards growing vegetables, planters are an ideal solution, especially for the smaller garden where the traditional vegetable plot isn't feasible. In the old days everyone had a driveway made of tarmac, concrete or shingle, which trod into the house and gradually disappeared as it migrated to other areas of the garden and into cars. Today we have a better answer and it's as economical as it is beautiful. Our block paving driveways are easy to maintain and they look fabulous, adding value to your home. You can check out some of our paved driveways in the gallery. Blocks can be laid in all types of pattern, straight, herringbone paving or something that is entirely individual to you. 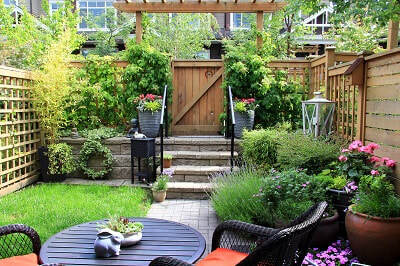 It can also be matched to features in your garden, like a patio or ornamental feature. If you'd rather have a drive constructed from paving slabs, we can do that too to give your property a unique and appealing look. The options are endless and practical. 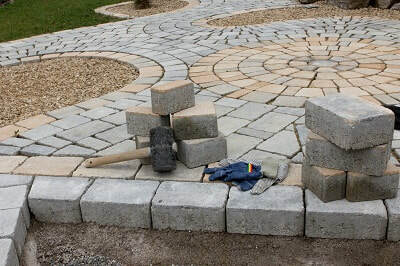 The landscape gardeners Horsham Decks and Patios are experienced builders of all types of hard landscaping for your garden. We build garden walls, arbours, gazebos, retaining walls, raised beds, planters and of course decking and patios of all types. 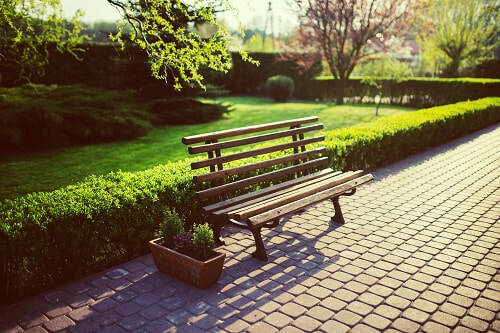 Our experts will help with your garden design and turn your ideas into reality. We'll work with you to produce the very best results and advise on materials and how your project comes together. We'll manage everything for you, taking the stress out of the job and we'll delight you with the results. Call us now for a chat and we'll be pleased to give you advice. 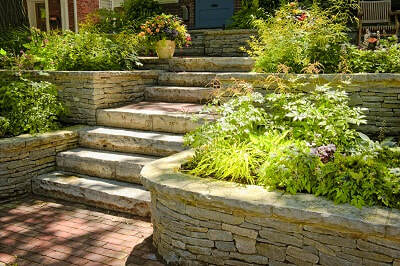 Visit our Garden Landscaping page for some great ideas. West Sussex is a wonderful place to live but in the Horsham area gardens can be a challenge in the winter with our heavy clay soil. That's why many people choose to have their gardens constructed to give dry areas that remain usable throughout the seasons. A path that leads around your plot can make life a lot easier than sinking into the mud or traipsing lumps of clay all over the place. Our West Sussex landscapers can turn your muddy patch into an oasis with lovely features that are practical and keep your feet dry and clean in the winter. A wood deck or a York stone patio, for example would be an ideal area for the children to play or to enjoy a morning coffee. 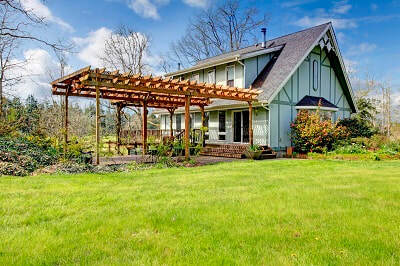 While a paved pergola or walkway will benefit the whole family and keep your house clean. Garden construction for a wheelchair user, including raised beds and vegetable planters and a flagged patio with ramp.